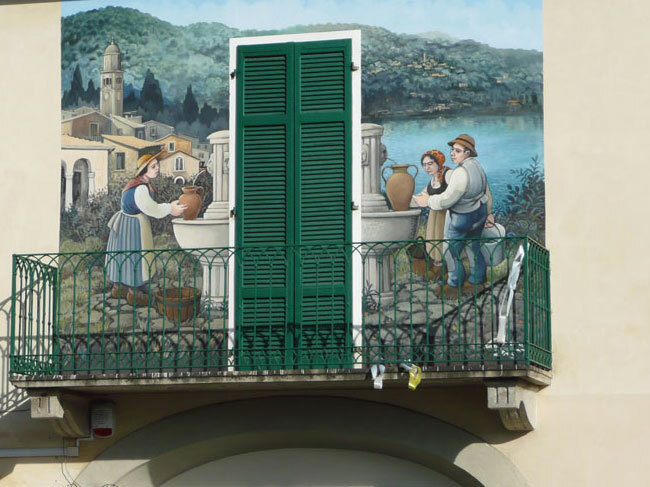 The little village of Pogno, about 20 minutes from Orta San Giulio has become a destination for lovers of popular art. The village has been painted to decorate, to remember and even to protest, creating a vast art gallery in the open air, fresh, imaginative, representative of its people who wish to tell their story in pictures. The first murals were chosen by the Town Hall together with “Muri D’Autore Servizi”, carried out from 20-26 June 2005 when the village filled up with accomplished painters and artists, the result being a series of seven wall paintings and a piece in ceramic, all shown on the walls of a number of buildings in the historical center of the village.